Treating arthritis is not easy.Apart from the regular medication, proper diet, rest and relaxation, doctors also recommend arthritis exercises. These are specially designed exercises for people with different types of arthritis. Exercising is a must do for all people suffering of arthritis because it will help them increase the flexibility of the joints, increase bone vigor, muscle strength and energy levels, so they will have a better control of their weight and a strong heart. But most of all, exercising will help keep joints completely movable and will fortify the adjacent muscles. This way, arthritis sufferers will experience less pain when performing the everyday activities. So it is fair to say that arthritis exercises are strongly recommended for arthritis patients by all the doctors in the world. But depending on the type of arthritis one person might have, the doctor will recommend a certain type of exercises. People should not choose the exercises program on their own; instead, always ask your doctor what exercises are recommended for their type of arthritis. Depending on the severity of the condition and which joints are affected, the doctor will propose a certain type of exercising program. There are three types of exercises: Range of motion, Strengthening and Endurance. Range of motion exercises, for example dancing, are the ones that move the joints in all directions, as far as possible. These are the easiest type of exercises recommended for all types of arthritis because they will keep the joints mobile and will prevent stiffness. Doctors advise their patients to perform a range of motion exercises every day, or at least every other day. The number and intensity of exercises can be gradually increased as the patient gets in shape. Strengthening exercises include isometric and isotonic movements. Isometric exercises are the ones that work the muscles without moving the joints, while isotonic exercises work both the muscles and the joints. Both types of movements help with building strong muscles around the joints that are causing problems. Stronger muscles will better support the joints, meaning pain will be reduced and the patient will move more easily. Unless the patient has swelled joints or severe pains, the doctor suggests doing strengthening exercises every other day. Endurance exercises are the ones that improve the cardiovascular condition by increasing the heart rate for at least 20-30 minutes. Not all arthritis patients can perform endurance exercises. Depending on the patient's age and physical condition, the doctor will recommend or not endurance exercises and also the type of exercises. Walking, bicycling or swimming are the best choices because their joints are not that stressed by these type of activities. For example, making exercises in warm water will help in two ways: the warm water will aid by decreasing the pain and relaxing the muscles, and at the same time the water will be supporting the body, this way placing less stress on the joints. Endurance exercises should be performed three times a week for about 20-30 minutes. 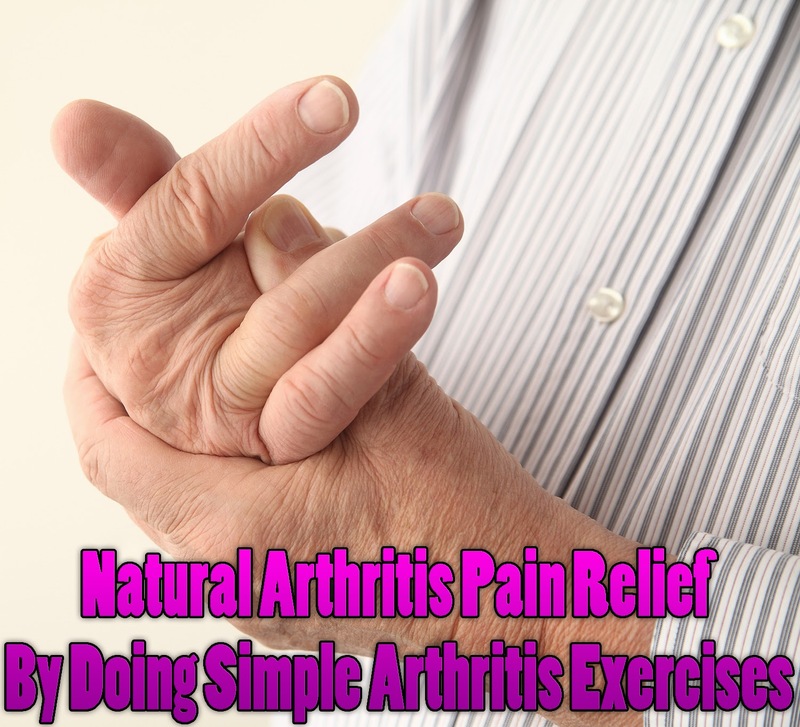 There are also other types of simple exercises that can be done by all arthritis patients. The every day activities can be easily transformed into arthritis exercises. In the morning when you get up and get dressed, try to amplify your movements, this way the morning stiffness of your joints will rapidly disappear. Also, take every chance to do some household activities like: wash the car or do the dishes because these movements will help decrease the pain from your joints. When you watch television, during the commercial breaks get up of your chair and do something; even small movements burn calories and help you reduce your weight. You can also park your car a little further away from office or home as walking will do you good. Before beginning an arthritis exercises program, always consult an experienced doctor or a physical therapist. They are the ones that can advise what exercises are recommended for specific types of arthritis. They can suggest a particular type of exercises for inflamed and swollen joints or certain exercises for particular joints. The exercising program should be started with easy exercises, but the difficulty of the movements should be gradually increased. The patient should also be careful to thoroughly warm up before starting the exercises and cool down after finishing the program. Although exercising is good for arthritis patients, occasionally some people can get into some uncomfortable conditions: augmented weakness, constant fatigue, joint swelling or pain that lasts more than one hour after exercises are finished. This means that exercises are too strenuous and the patient should talk to his doctor and make the necessary changes in his exercises program. After finding the ideal arthritis exercises program, the only thing that patients have to do is to strictly follow it and the improvements will soon appear.